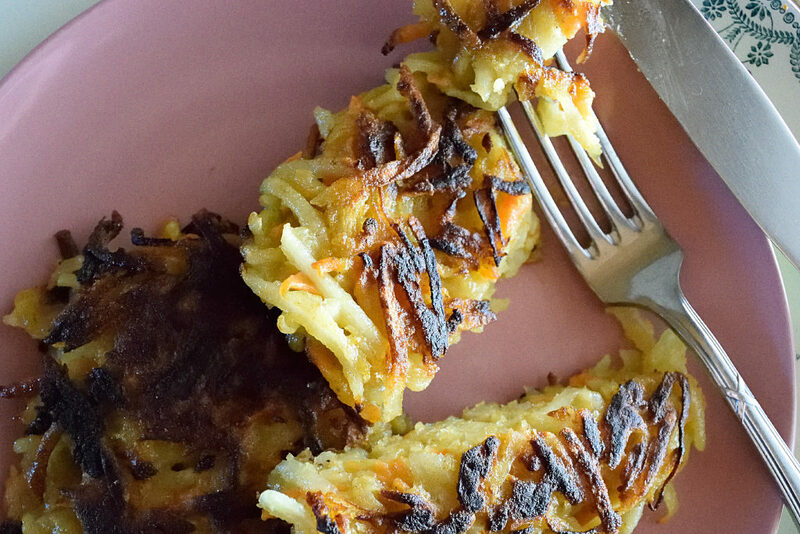 Fritters are a great way to make kids eat their vegetables. Because when you eat these you almost forget that you’re eating veggies at all. We usually eat them as a side dish but they work great as appetizers as well. 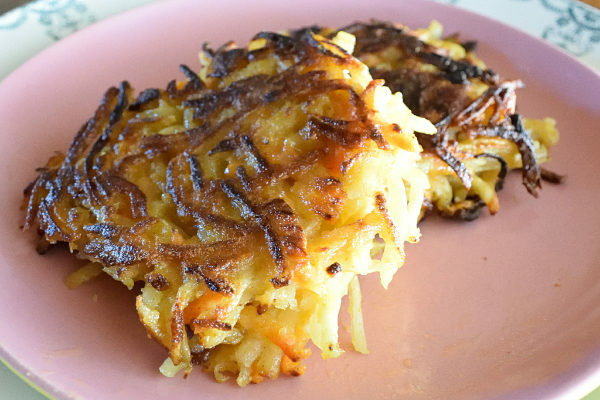 Fritters are a great dish for using up any left-over vegetables. They’re quick and easy to make. 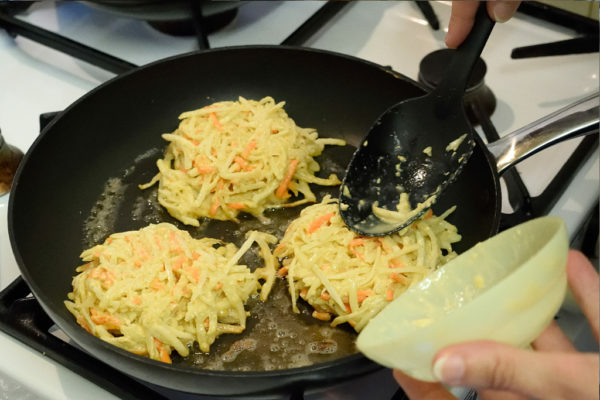 The recipe is also easy to adjust, so you can make your fritters completely to your liking. 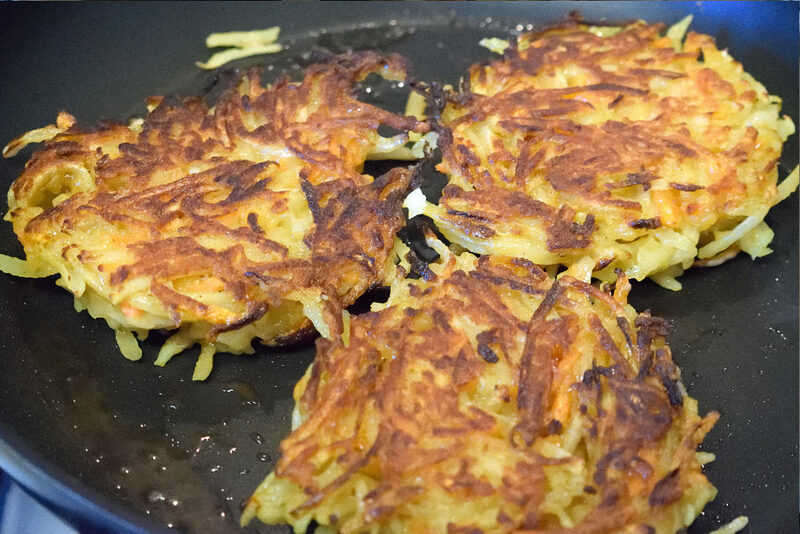 Vegetable fritters are made up of 3 components: grated vegetables, a binder agent and spices. 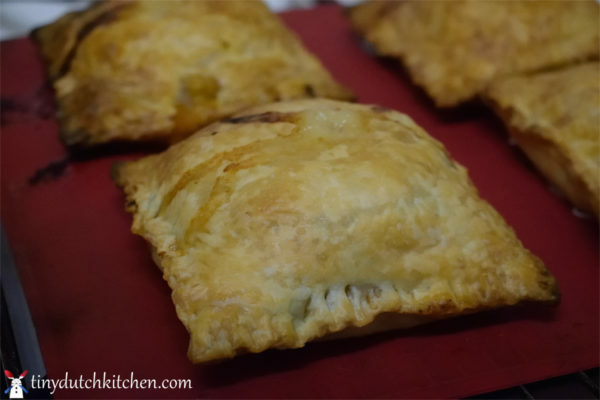 Many recipes also contain grated cheese but because this recipe is vegan, I left that out. These fritters are delicious without it anyway. 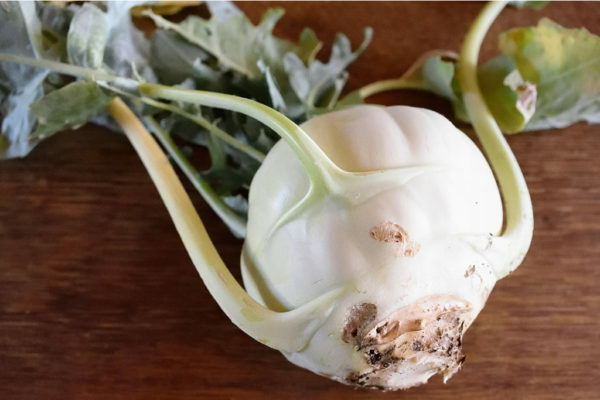 For the vegetable part, you can pretty much use any vegetable you like. However, I found that root vegetables work best. These are sturdy vegetables that don’t turn into a pulp when you grate them. They also don’t release a lot water, which could otherwise make your fritters very soggy. 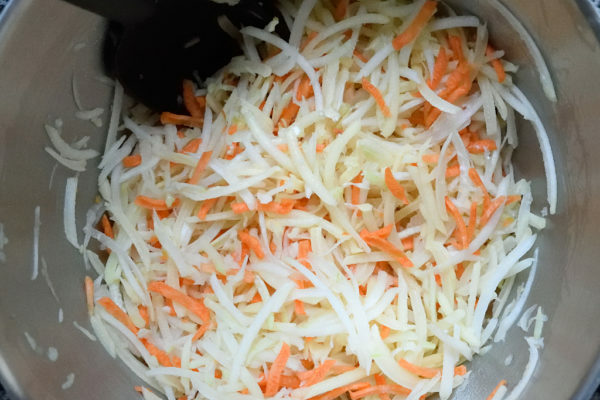 I’ve used different combinations of potato, carrot, celeriac, kohlrabi or onion. They all tasted great. I did always include a little bit of potato though. The starch in the potatoes helps to keep the fritter together. Once cooked, it also gives the fritters a nice colour. In non-vegan recipes the binder agent is usually egg. 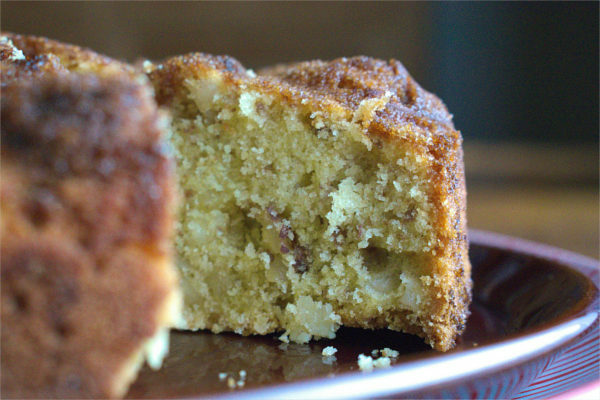 In this recipe it’s a simple mixture of flour, water, baking powder and vegetable oil. For spices I used some ras el hanout. However, you can easily replace it with any other spices you have. (Our homemade curry powder is a great option too!) Some garlic powder or a bit of tabasco sauce are also great additions. 600 gr vegetables potato, carrot, celeriac, kohlrabi, onion, etc. 2 tsp spices ras el hanout, curry powder, etc. Clean and peel the vegetables. Coarsely grate them and stir them together. Mix the flour, baking powder, spices and garlic powder together. Then stir them through the grated vegetables until evenly distributed. Add the water,oil and tabasco sauce and stir again. The vegetables should now start to stick together. 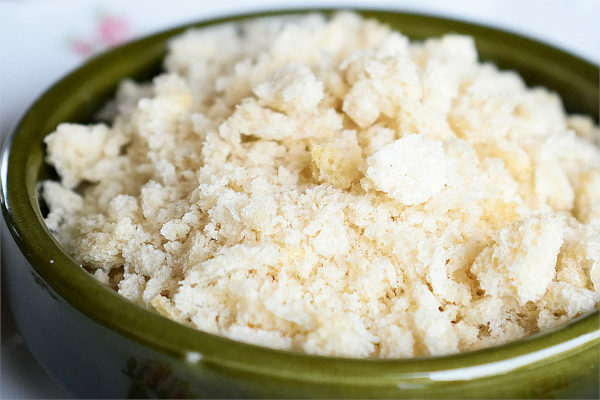 Form the fritters by putting the mixture into a small bowl and compacting down. You should be able to get about 8 fritters from the mixture. Tip the fritters out of the bowl, into a hot skillet. 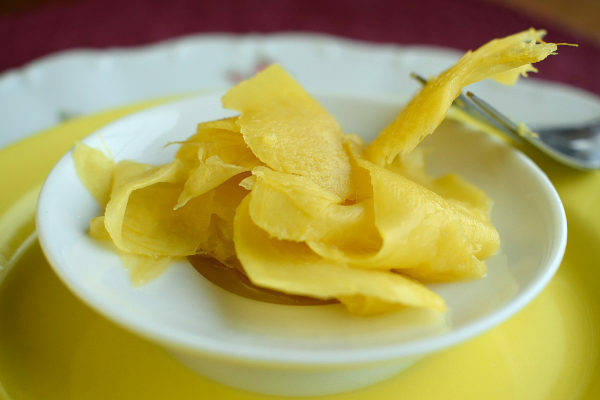 I fried them in margarine, as this gave the fritters the best colour. You can also cook them in oil however. Cook them on medium heat, for about 3 minutes on each side.